A Book? Or a magazine? Latest news . . It's published! It arrived on the evening of 23rd March 2015, the day the sun moves into my star sign! My printer did it in advance because he has so much to do with all the elections at the moment . . . It came about when I thought it would be interesting to make a collection of articles about Rennes-le-Château and its region as it appears to those people who know it well. I publicised the idea, mostly on Facebook, and stories came flooding in. These have now been finalised, the printer has been contacted and we are expecting copies to launch in Rennes-le-Château on our first trip of the year - Easter Sunday! You will be able to read about the "spiritual vortex" of Rennes-le-Château, reincarnation at Montségur, meeting with Henry Lincoln, the village symbolising the meeting of the God and the Goddess (wait till you read it), the meaning of the myths of Bugarach, the evangelists of the Roman Church, Bérenger Saunière's secret ambitions, meeting Mary Magdalene at Rennes-le-Château, and a comparison of the troubadour's creation of romantic love with today's "Divine Union" ideas. No writer knew what other writers had written and a surprise that emerged was the interest in our region in the Holy Grail and its mysteries. Is Rennes-le-Château a Holy Grail myth in disguise? Could be! Many people, some of them "Rennie celebs" have written about their personal experiences in our magic region and their subsequent move to live here permanently. Find out about Anneke, about Anaiya, about Tim Wallace-Murphy . . . These make moving stories. All the writers will receive free copies, of course. I'm so thrilled that this idea has worked so well. Next year we'll do another "Your Take for 2016" and that should be really interesting, because new ideas are always being aired at Rennes-le-Château, the "scene" never stands still. Maybe the same writers will tell us how their year has passed and so "My Take" will be the definitive yearly journal of the Rennes-le-Château community. Back to 2015! As well as the launch on Easter Sunday, we'll have a party for the readers and writers of "My Take" at Rennes-le-Château in the summer. The date of 6th June comes to mind . . . click here. Just a note in 2016 - I decided for various reasons that I was unsure about a magazine concept for technical reasons; launching a magazine is different to promoting a book, especially when all has to be sold within a year. However, there are still a few copies left at a reduced price and people are still interested in it . . .
Click on the little arrow to find your option according to where you live, click that, then click "Buy Now" and then you pay with a credit card in the usual way. 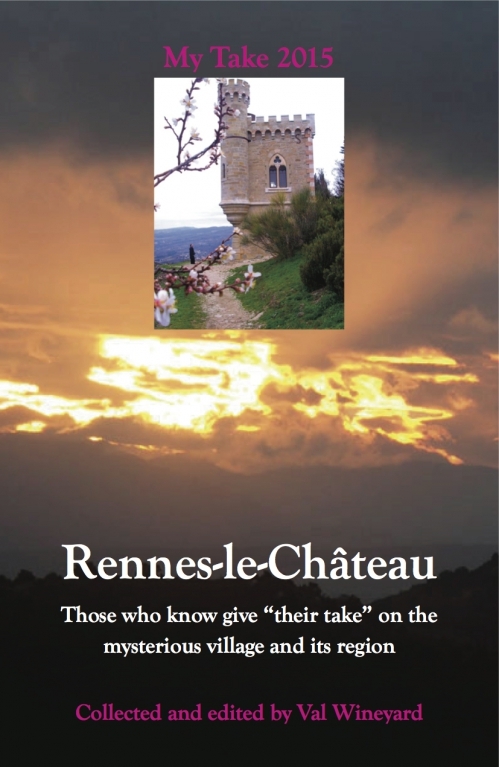 If you love Rennes-le-Château, or feel personally involved in its mysteries as so many people do, you will enjoy this book where the "Rennies" speak their hearts!